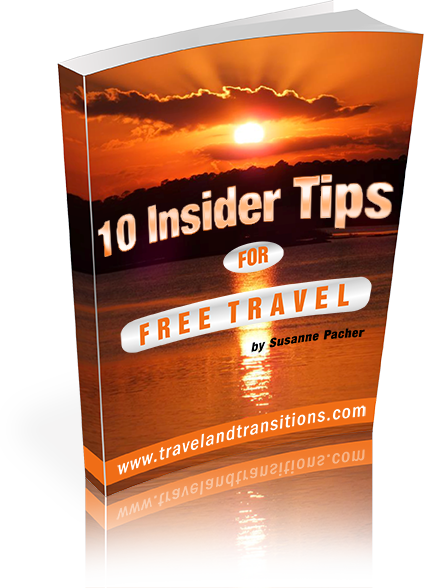 In the late morning of January 5, 2015 I made my way from the Canto del Sol Resort to the office of Vallarta Adventures, just about five minutes away. Several people were waiting there already to be picked up and taken to a ziplining adventure in the mountains east of Puerto Vallarta. The adventure began when we were picked up by a small truck with a canvas roof and open sides and started driving southwards towards downtown. Then we made a sharp left and began driving inland, next to the Cuale River, past several small local villages where hardly any tourists stop. From the river we started heading up into the mountains on a narrow road until we had reached Canopy River Ziplining, an eco-adventure and sustainable tourism company that offers ATV tours, tequila tastings, river expeditions and ziplining in Puerto Vallarta. Our group was welcomed with a bright orange fruity drink and then it was off to get checked in, sign the release forms and get our helmets and the bandanas which went underneath our helmets. Lots of Canopy River guides, all dressed in neon green polo shirts, were taking care of different groups of tourists in search of adventure. 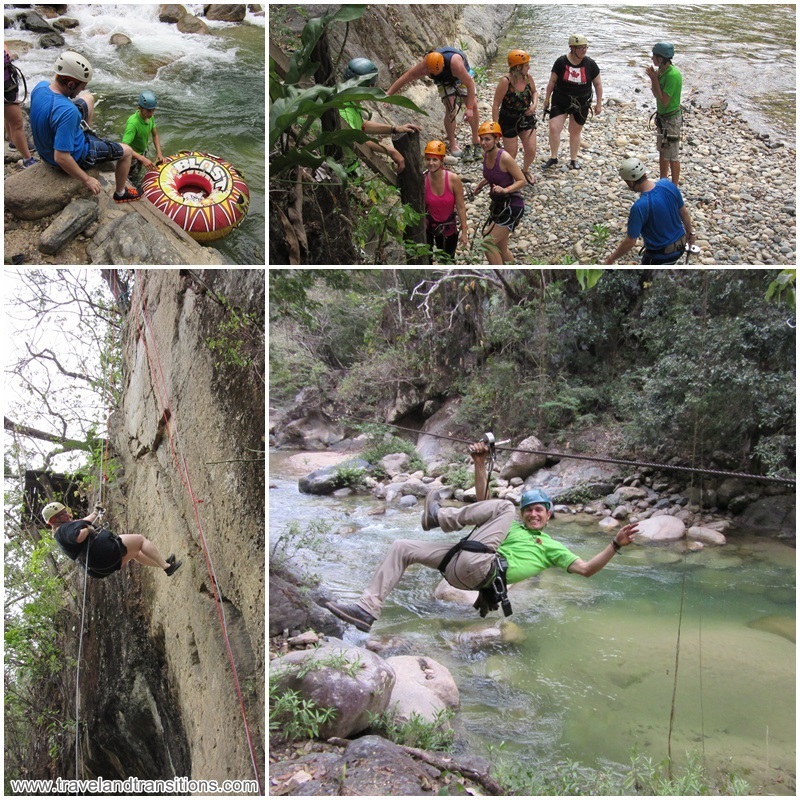 After a final pit stop it was on to our River Expedition Adventure which started with ziplining. But before we were ready to zip across the valley we had to undergo a safety briefing. Our head guide Arturo, a real character who absolutely loves his job, instructed us on how to zipline safely, how to strap ourselves in with the safety harness and how to wiggle our pulley in order to slow ourselves down. 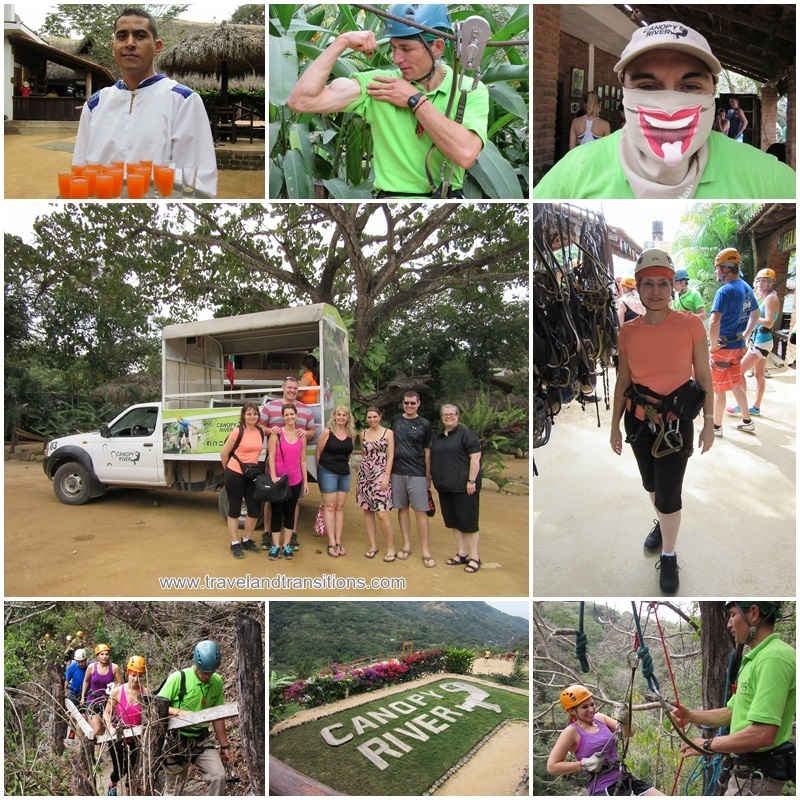 Then, after a few minutes of walking we arrived at our first real zipline that went all the way from the top of the mountain across the valley to the other side, high above the river. I was one of the first people to go as I wanted to document the entire experience with video. Rafa, the younger brother of our head guide Arturo, took me under his wings and went across the valley with me, taking care of the braking as I had my hands on the camera. It was absolutely exhilarating, being so high up and whizzing across an entire valley to a platform in the middle of the jungle on the other side. I couldn’t help but let out a few excited squeals. Once I had arrived on the platform I admittedly was a bit relieved since the experience had been much less scary and so much more fun than I had anticipated. On the other side I set myself up with the camera and filmed the other group members as they raced across the valley and arrived with gusto on the platform. One of the young ladies in the group went across with one of the guides and was even hanging upside down, screaming with excitement. After our first zipline we went on another brief hike through the jungle and Arturo showed us some mini-coconuts that we got to taste. Then we had to cross some swinging bridges, which were very basic – a narrow wooden plank with a thick metal wire as a handrail. Fortunately we could strap ourselves to the wire with our safety harness. Of course one of the big guys in our group had to start swaying the bridge, which made it even more challenging for the rest of us to get across. 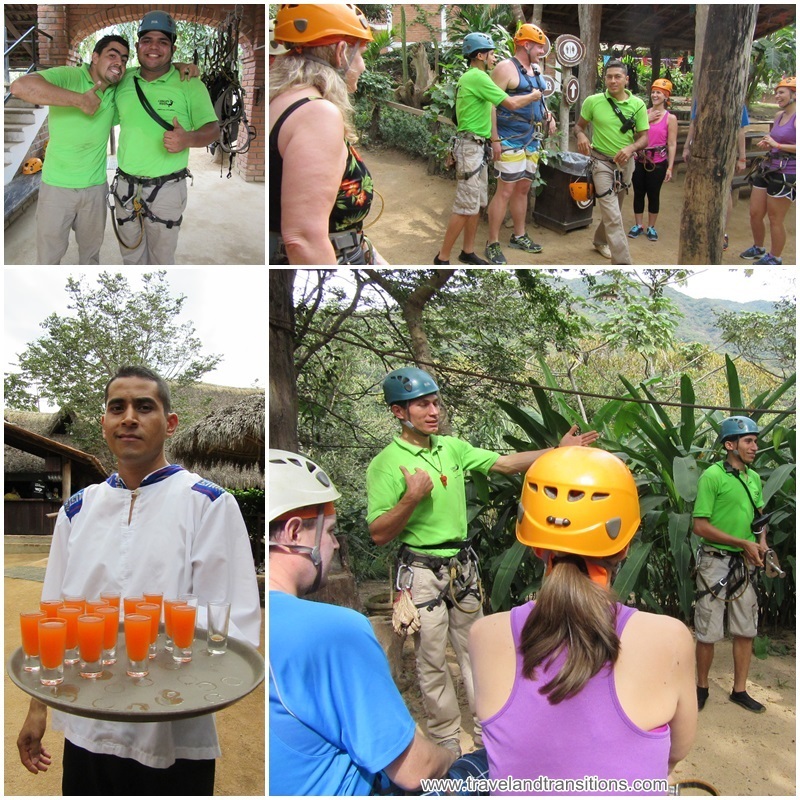 After various ziplines and the swinging bridges we also had to rappel down about 20 feet. Turning around, all strapped into the ropes, and assuming the position for rappelling by hanging outside of the platform was the scary part we all had to get over. But of course we were safely strapped into the ropes, and guides on top and below the platforms were ensuring our controlled descent. After rappelling from a wooden platform we rappelled again, this time down a vertical rock wall. But the second time around we were old hands at this business and felt totally comfortable walking vertically down a rockface, protected only by ropes. Several ziplines later we had reached the river at the bottom of the valley. Now it was time for the river portion of our River Expedition. Our three guides worked together to throw inner tubes into the water and all our group members plopped into the inner tubes, one by one, and rafted some distance down the river. Everything was, of course, being documented by the photographer, another green-clad staff member, who came with us and documented all the exciting and embarrassing moments. At one point he even ziplined across the river, stopped in the middle of the zipline, hung upside down and took a picture of all of us. 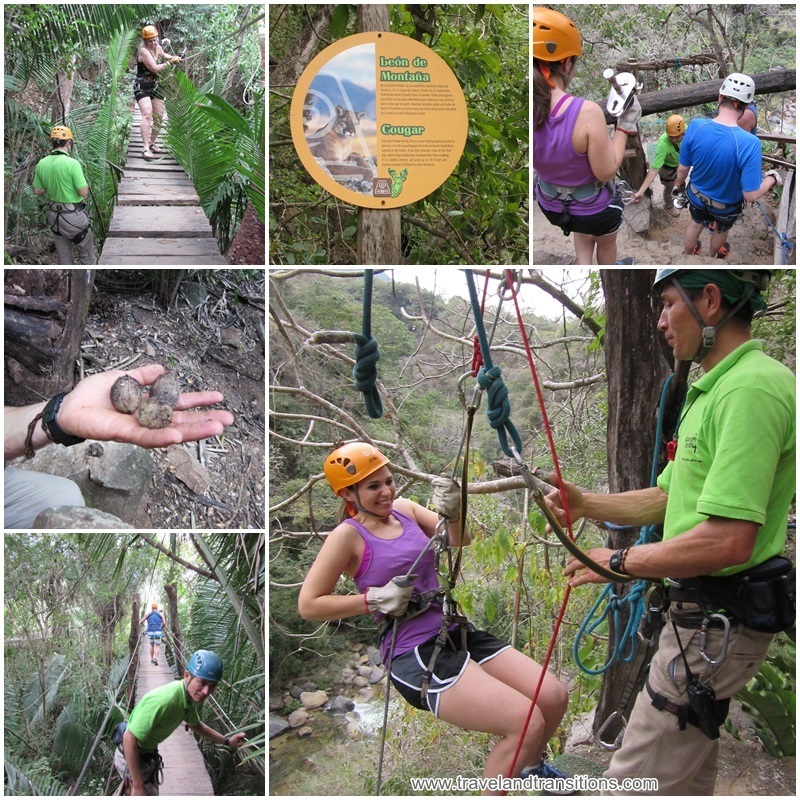 After crossing seven ziplines, several swinging bridges, after two rounds of rappelling and an inner tube ride we had definitely reached the lowest altitude of our mountain experience and I was already wondering how we would get all the way back up to the top of the mountain. 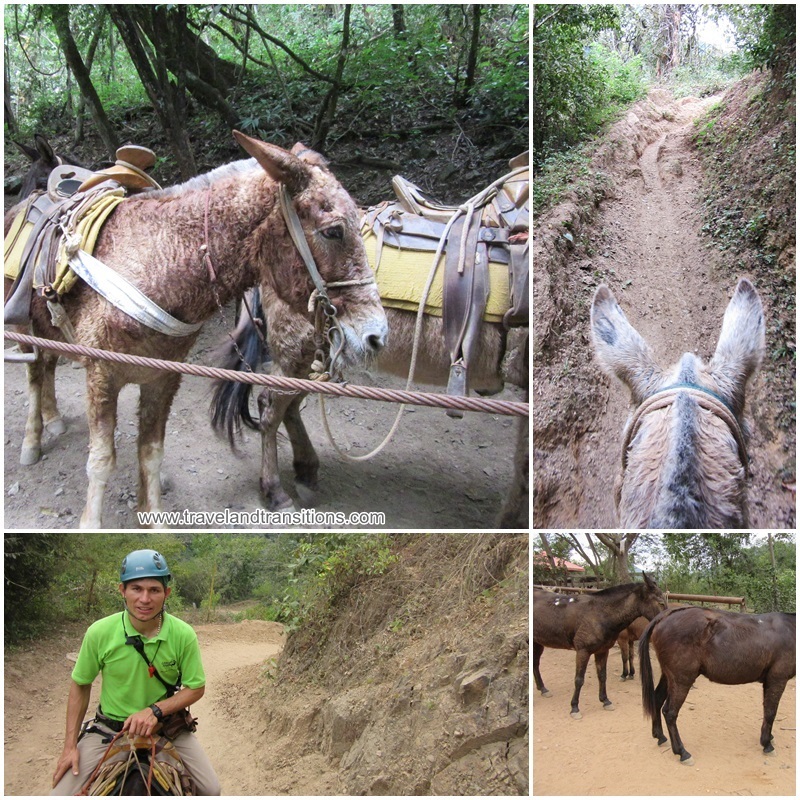 But no worries: there were 11 mules waiting for us, seven for us adventurers and four for our guides. One by one we all got on the mules and started to make the slow, steep and rocky trek back up the mountain. I was absolutely surprised at how agile and surefooted these animals were and how willingly they accepted human cargo of different weight categories. As we ascended the mountain, the views got better and better until we could see all the way to the ocean once we had reached the top. At the top we shed our harnesses, the bandanas and the helmets and we had a bit of time to relax at the top and even order some drinks at the bar. I had a chance to chat with Rafael who is the concierge at Canopy River and he explained to me that this area is called “Ejido El Jorullo”, a cooperative, where 170 farming families own the land in this valley. 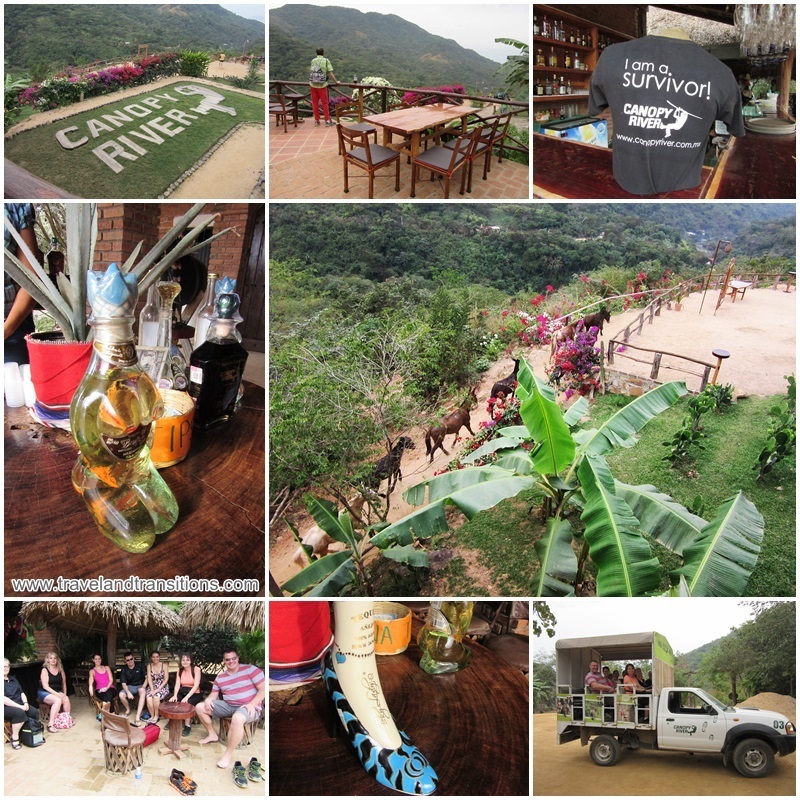 We took a walk around the mountaintop facility and visited the restaurant, the dressing area, a sitting area where a young lady by the name of Esmeralda was providing tequila tastings. Some of the bottles were shaped like a voluptuous woman’s torso and I found out that they were called “booby bottles”. The view from the top of the mountain of the surrounding scenery was outstanding. Rafael explained that 35 families started this operation eight years ago in order to provide employment for the local families, and today about 200 people are employed at Canopy River now, a great way of providing jobs to the local residents. Altogether there are 12 ziplines, 38 ATVs and 2 racers (similar to dune buggies) here that provide excitement to adventurous tourists. Canopy River also hosts evening events at their restaurant and is a popular destination for weddings. So we had reached the end of our adventure and were conveniently taken back to our various hotels in the city. Lively conversations were taking place in the truck and new friendships had been made after a day of outdoor adventure at Canopy River. We all enjoyed the excursion so much. It was nice to read your article. I also forwarded to everyone in our group. Hope your travels are still going well.